Circuit: CMOS SCHMITT TRIGGER IC MAKES VCO __ Circuit designed by David A. Johnson, P.E. 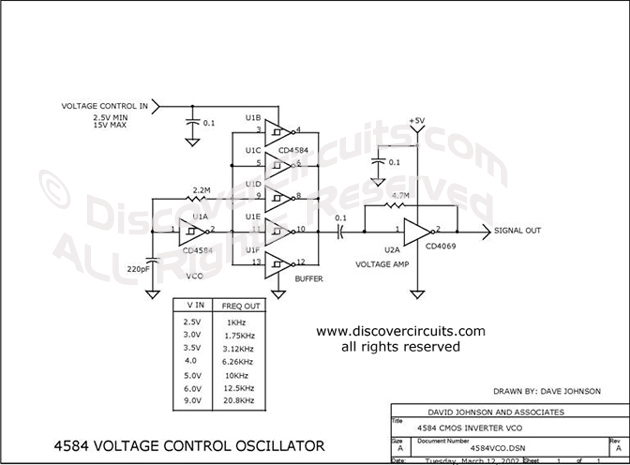 By changing the supply voltage fed to a classic 4584 Schmitt trigger type oscillator, the oscillator frequency can be changed over a range of 50:1. A 74HCU04 inverter is used at the output of the 4584 to maintain a constant TTL logic level signal.